The holster story started in Noosa, Australia in 2001. Initially, founders Ben Nothling and Natalie Miller began crafting a range of jelly sandals and espadrilles and following this vision have been creating, innovating and improving designs with each season, which has now morphed into a fully fledged line of vegan friendly trans seasonal footwear for women and children. As parents, they are acutely aware of the environmental impact on future generations. As such, one of their key principles is to be a sustainable company achieved by reducing holster’s ecological footprint including utilising recycled materials for packaging. 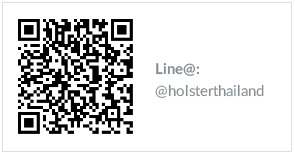 holster is distributed in Thailand by 3LN Co.,Ltd.